WEBMASTERS Review 2019: Is WEBMASTERS a Good Hosting? With a range of annual and semi-annual plans, WEBMASTERS is a medium-sized Japanese hosting service that deals in domain registration, server rentals, dedicated VPS, and premium SSLs. Most of its customers are based in Japan. 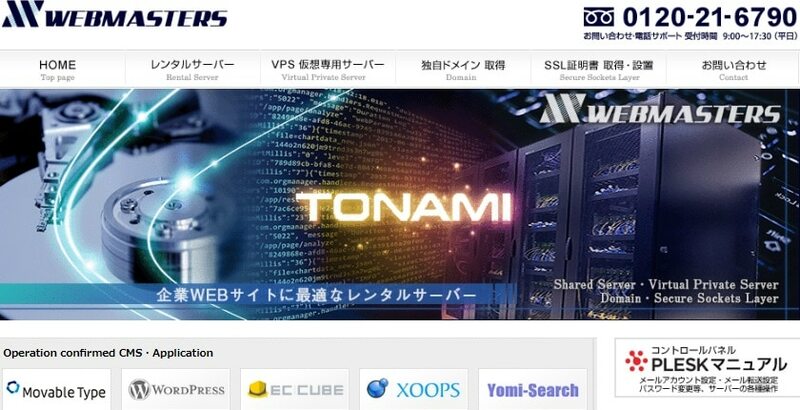 Besides registering domains and hosting websites under shared hosting accounts, WEBMASTERS has been providing individuals and small businesses in Japan with dedicated VPS and extras such as SSLs. Its website is in Japanese only. With WEBMASTERS, you get all the resources you need to build, manage, and secure your websites. Popular CMS’s such as MicroEngine Xoops, EC Cube, Movable Type and WordPress are just a few clicks away. Developers also have a range of scripting and programming tools such as PHP, Python, and Ruby, which they can use to create custom web apps. It’s also nice to see that WEBMASTERS gives its customers decent options for securing their websites and databases. Besides securing their emails with anti-spam and antivirus protection, they can also protect their website using Premium SSLs such as Rapid SSL, Comodo Instant SSL, and Verisign among others. Customers who sign up for the two higher level plans also get Static IPs. Though WEBMASTERS doesn’t support cPanel, it gives users familiar tools for managing their website, databases, and emails. Every shared hosting account runs on Plesk, a user-friendly control panel which comes with a web-based file manager, email accounts, FTP accounts, and PhpMyAdmin among other tools. WEBMASTERS’ dedicated VPS is an intermediate solution for customers who’re looking for more customization options or more storage space and processing power for their websites or enterprise apps. Servers are scalable and not affected by other users. They’re powered by CentOS and run on Plesk. New customers have the freedom to install an operating system of their choice. WEBMASTERS offers four fairly-priced hosting packages with semi-annual and annual billing cycles. Pricing includes an initial setup fee, hosting contract fee, and domain registration fee. If you want to upgrade, you’ll pay the difference between the current plan and the plan you want including tax. VPS customers are eligible for a 30-day trial, but first they must apply to get a pass. When placing orders for shared hosting or VPS, customers can also add premium SSL and domains before checking out. Bank transfers and all major credit cards are accepted. Hosting packages are not geo-restricted, so customers from any part of the world are free to place their orders. It’s also easy to cancel, though you’ll need to notify support when you do so. 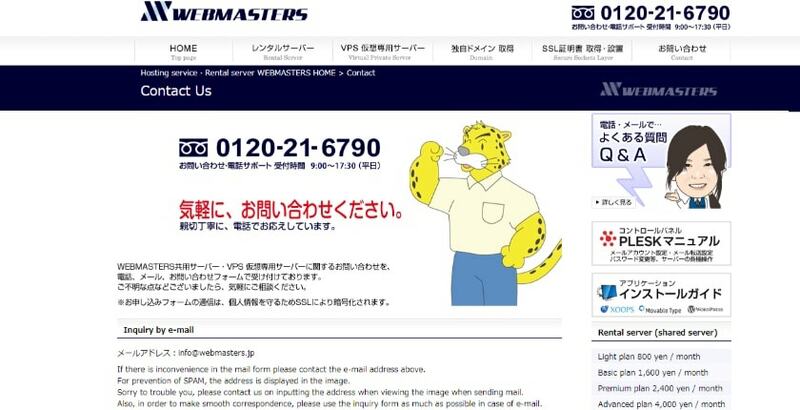 Live support is available via telephone between 9:00 a.m. – 5:00 p.m. (GMT+ 9) in Japanese, though customers can make email inquiries or use the contact form on the WEBMASTERS website. Besides local support, the company has a pretty detailed Plesk manual and FAQs that address most basic problems. WEBMASTERS offers reasonably priced shared hosting and customizable VPS and dedicated servers along with .jp domains to customers who want to set up websites in Japan. Wondering how WEBMASTERS stacks up against other Web Hosting companies? Enter any other Web Hosting company and we will give you a side-by-side comparison.